The ambition of SAP S/4HANA is nothing less than being the de facto business standard solution for the digital economy. This Monday, October 31st, we made another big step towards this goal with the SAP S/4HANA 1610 release, by building new and enhanced innovations on top of SAP S/4HANA on premsie Edition 1511. In this blog you will receive an insight into two topics that are covered by this recent release. First, Advanced Availability to Promise (aATP), which is one of the new innovations with the 1610 release and second, Efficient Procurement, which is an enhanced innovation. Happy customers are the most essential success factor of enterprise competitiveness. It represents the essential performance measure criteria in the digital supply chain. In this context, the Available to Promise (ATP) function presents one of the most important functions within the enterprise and the supply chain. As the name suggests – the initial role of the ATP function is to provide information on the product availability to the customers who seek them. However, that is not all as the ATP function also needs to ensure that the quantity promised can be delivered on the date promised. 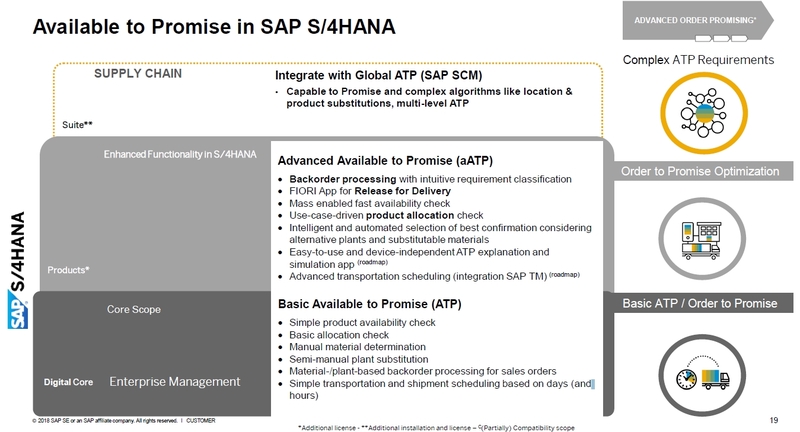 With SAP S/4HANA, we introduce a new ATP called advanced Availability to Promise. With the advanced ATP, we introduced a major enhancement concerning the back order processing. The traditional system follows the first-come, first-served process, which doesn’t consider the priorities of the company, demand forecasting and the rush orders. In this traditional system processes orders mainly according to the sequence of arrival but not according to the expected due date. With SAP S/4HANA, we introduce a “Winner – Gainer – Loser” concept allowing you to prioritize orders according to their value for your company. This gives you full control in critical, fast changing availability situations in the digital economy. Think of the following situation: You do not have enough products available to fulfill all due orders. You’re bound by contract to deliver exactly what a certain customer has ordered. Moreover, this morning a rush order arrived from a customer whose contract will be renewed shortly. You also have orders from customers that are on credit block and thus can’t be delivered. Additionally, there are orders in the future with reservations that came in already two months ago. With the “Winner – Gainer – Loser” concept BOP will take care of the redistribution of the already reserved quantity and the important orders. With 1610, the functionality is delivered with a new designed “Release for Delivery app” in the Fiori 2.0 “Belize” design theme, which is the successor of the former “Blue Crystal” theme and which comes in a dark and a light flavor. Procurement teams provide valuable input in terms of vendor negotiations, quantities, product specifications, pricing, discounts, lead times, and so forth. Finance departments take care of invoicing, managing all payments and collections, and checking if taxes and duties were paid correctly. All parties also collaborate closely with project management teams to ensure that the supply chain timing remains coordinated with project timing. With the SAP S/4HANA 1610 release we offer quite a few highlights. One would be Order Collaboration, which allows automated, paperless processing of business documents. Another one is Invoice Collaboration, which means No-touch Invoice postings and manual handling only on exception, like if the credit limit has been reached. And Discount Management, which allows an effective use of free cash, reduces Days Sales Outstanding, and solves cash shortages. All this comes in a comprehensive Procurement Overview Page that monitors critical business events, purchasing spend and supplier performance. It will change the way your Procurement teams work. Stay tuned for even more insights into the SAP S/4HANA 1610 release as we will be covering the topics Industry to Core, Extended Warehouse Management and more. If you enjoyed this blog, find the information useful or want to read more blogs like this, let us know by hitting the “Like” button. Stay tuned for even more insight about the SAP S/4HANA 1610 release. Next up my colleague @ypeterschmitt will be sharing 1610 innovations around EWM (Extended Warehouse Management). If you enjoyed this blog, found the information useful or want to read more blogs like these, let us know by hitting the “Like” button. Thanks for the article, Bert. Is multi level ATP (check availability of components that exists in gATP) available in 1610 as part of the changes? If not, is there a plan to? Hi – It is not part of 1610. But, the said functionality is in the roadmap and it will be available by the end of 2019. 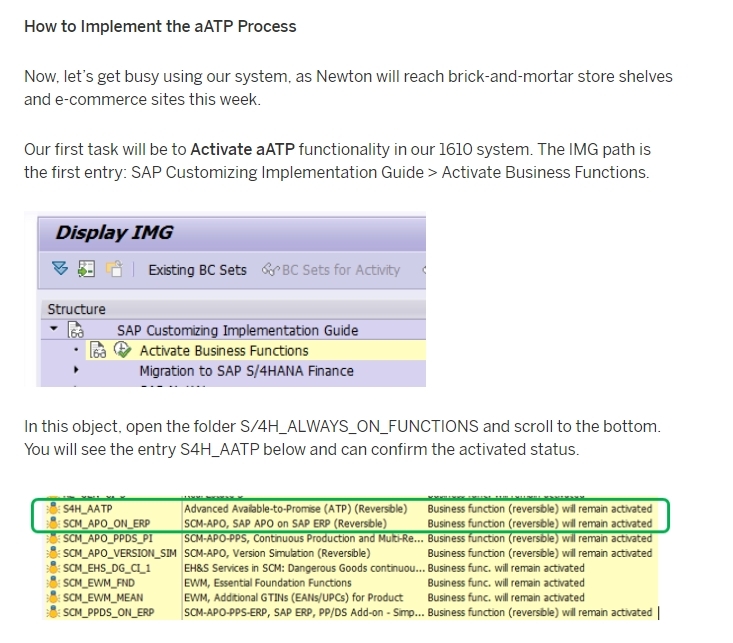 Bert Schulze can you tell me if advanced ATP has available the Multilevel ATP Check wtihout the PP/DS in S/4 HANA?